"About 60 pastors from around the Upstate (area) joined her (Hillary Clinton) on stage at the Marriott at Renaissance Park — all but two of them were black — and her campaign said another 20 or so were in the audience. The crowd, more than 400 strong, was about two-thirds white." I bet the 2/3 of the crowd enjoyed seeing all those Black so-called leaders pick a White woman over Obama. There is a sense that some weak-minded Black Democrats, fearing America might not really be ready for a Black president, prefer a Hillary win to an Obama loss to McCain. They think McCain is the Devil but the Devil is inside their weaknesses... Just saying. 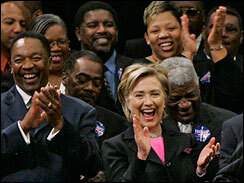 When former President Bill Clinton was stumping in SC a few weeks prior to that photo-op, he held closed-door meetings with local blacks who propped themselves up as "Leaders" and together they apparently hatched a plan for the "Black Preachers for Hillary" which should've not only moved voters towards her but also shown Obama as a weak Black man amongst his own people because they preferred HER, a White woman over HIM, a Black man. She played the RACE CARD!!! Obama has a plethora of White voters solidly behind him and it would be out-of-character for him to think about such a classless act. Who do these 60 Black men speak for and who do they deliver? They speak TO their parishoners and not FOR them. Why not line up 60 black teachers and professors to show folks how much pull Hillary has in what could be Obama's community? Why not 60 black South Carolina lawyers? Doctors? Accountants? Executives? Engineers? Architects? It was racial and classless too. Obama would never stand in front of 60 white reverends to beat Hillary down or diminish McCain. You shouldn't need a calculater to understand WHY Obama won either.